Yellowish stains on walls and ceilings are a sign of excessive moisture. 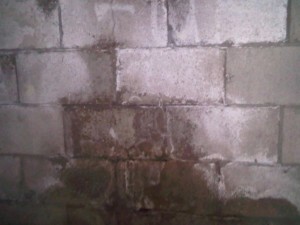 Dampness on the floors, walls or ceilings of your basement can lead to mold growth or rot. The ideal relative humidity level in your basement (regardless of the outside temperatures) is 50%. Condensation or dampness is a sign the humidity level is too high. Staining is a sign that water was there. This means you may have a reoccurring leak. It is common to have a water problem only when it rains; however, just because the water disperses doesn’t mean it isn’t causing problems. Find the source of the water and fix the problem. Whether the water source is a foundation crack or a leaky water heater, excess water in the basement is a problem.